If you’re reading this blog, then you’re probably like me. You’ve eaten a good breakfast this morning. You have a fridge full of food. You worry about over-eating. You never worry about going hungry. For many of San Diego’s schoolchildren, going hungry is a stark reality. 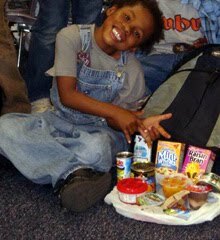 That’s why in 2007 the San Diego Food Bank created the Food 4 Kids Backpack Program which provides chronically hungry elementary school students with food-filled backpacks for the weekend. Today, I’m asking you to help the San Diego Food Bank and their Food 4 Kids Backpack Program. Here’s how the program works: Although qualifying children receive free or reduced-cost school lunches, many of them don’t have enough food to eat over weekends and school holidays. So every Friday, these students are given a backpack filled with non-perishable child-friendly foods. During the 2008-2009 school year, the program served just 200 children in eight schools throughout San Diego County. They are now serving 550 children in 19 schools and are looking to expand that to 850 children this year. Last year, San Diego food writer, Caron Golden (San Diego Food Stuff), and food blogger, Alice Robertson (Alice Q. Foodie), launched a fundraiser for the Food 4 Kids Backpack Program. They collected over $6,000 and 1,200 pounds of food, plus scores of backpacks. It's time for the second fundraiser, and I’m happy to be on this year's committee. We’re holding the fundraiser over the summer (August 21st) so that the money, food, and backpacks we collect can help enroll more students and schools at the beginning of the school year. In addition to Caron, Alice, and me, our wonderful committee includes local chefs Diane Stopford and Amiko Gubbins, PR maven Peyton Robertson of Bay Bird PR, and NBC San Diego anchor/reporter Catherine Garcia. 1. Monetary donations: We've set up a fundraising page at www.firstgiving.com/food4kids. You can make donations here, add comments, and keep track of our progress. This page runs through the end of August. And, thanks to NBC San Diego for contributing the 7 percent cut firstgiving.com takes of the total raised on the site so we don't lose any money you give! 2. 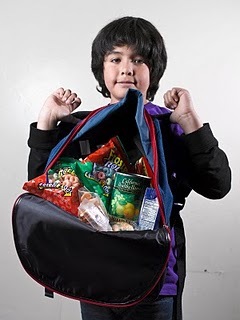 Backpack and food donations: We are encouraging people to collect neutral backpacks (preferably logo-free, black or red one since those are the kids’ favorite colors) and kid-friendly non-perishable foods such as applesauce, cereal, fruit and pudding cups, juice boxes, soup, and macaroni and cheese. The collection for this food and backpack drive will be at the Little Italy Mercato on Saturday, August 21. 3. Dining out donations: A “dollar-a-dish” event throughout the month of August. Over 40 San Diego restaurants will select one of their best selling dishes and for the month of August will contribute $1 for every dish sold. As an added incentive, those who contribute to the firstgiving.com page and food/backpacks at the Little Italy Mercato collection event will be entered into a drawing for raffle prizes. Winners will be announced at the Mercato on August 21. Dine at these San Diego eateries during the month of August, and support the Food 4 Kids Backpack Program. Here's the current list of participating restaurants. I’ll tell you more about them next week and include any newcomers. Our Facebook page is www.facebook.com/food4kids. Take a moment to “like” us. This is a gantastic program Susan.